The Gospel of Luke (Luke 16:19-31) tells of the relationship, during life and after death, between an unnamed rich man and a poor beggar named Lazarus. The traditional name, Dives, is not actually a name, but instead a word for "rich man", dives, in the text of the Latin Bible, the Vulgate. The rich man was also given the names Neuēs (i.e. Nineveh) and Fineas (i.e. Phineas) in the 3rd and 4th centuries. The name Lazarus (from the Hebrew: אלעזר, Elʿāzār, Eleazar - "God is my help") also belongs to the more famous biblical figure Lazarus of Bethany, also known as Lazarus of the Four Days, who is the subject of a prominent miracle of Jesus in the Gospel of John, in which Jesus resurrects him four days after his death. Critics of this view point out that "The "soul that sins, it shall die" (Ezekiel 18); "For dust you are and to dust you shall return" (Genesis 3:19). Paul (1 Thessalonians 4:13-18) describes death as sleep until the Day of the Lord, when the dead will receive glorified bodies upon the resurrection (1 Corinthians 15). No scripture, other than Philippians 1:23-25 (in which the apostle expresses the confidence that on departure from this life he would be with Christ), 2 Corinthians 12:2-4 (in which he affirms the possibility of being taken to paradise out of the body), 2 Corinthians 5:8, etc., accounts for a disembodied soul and its comfort or torture. Because this seems to raise the question of what kind of body is tortured in Hades as depicted in Luke, there are those who maintain that whilst the conversations took place as described, the language used in them, referring to body parts, etc., was figurative. The 19th century evangelist, Brownlow North inclined to the view that the story described a literal, historical event, but did not exclude the possibility that it might be purely a parable. An alternative explanation of the parable is a satirical parable against the Sadducees. One writer to identify the Sadducees as the target was Johann Nepomuk Sepp. 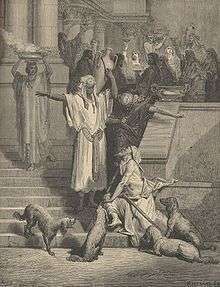 The arguments in favour of identification of the Rich Man as the Sadducees are (1) the wearing of purple and fine linen, priestly dress, (2) the reference to "five brothers in my father's house" as an allusion to Caiaphas' father-in-law Annas, and his five sons who also served as high priests according to Josephus, (3) Abraham's statement in the parable that they would not believe even if he raised Lazarus, and then the fulfillment that when Jesus did raise Lazarus of Bethany the Sadducees not only did not believe, but attempted to have Lazarus killed again: "So the chief priests made plans to put Lazarus to death as well" (John 12:10). This last interpretation had wide circulation in France during the 1860s-1890s as a result of having been included in the notes of the pictorial Bible of Abbé Drioux. 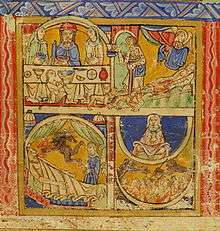 Simon Perry has argued that the Lazarus of the parable (an abbreviated transcript of "Eleazer") refers to Eliezer of Damascus, Abraham's servant. In Genesis 15 - a foundational covenant text familiar to any 1st century Jew - God says to Abraham "this man will not be your heir" (Gen 15:4). Perry argues that this is why Lazarus is outside the gates of Abraham's perceived descendant. By inviting Lazarus to Abraham's bosom, Jesus is redefining the nature of the covenant. It also explains why the rich man assumes Lazarus is Abraham's servant. Most Christians believe in the immortality of the soul and particular judgment and see the story as consistent with it. Others believe that the main point of the parable was to warn the godless wealthy about their need for repentance in this life and Jesus did not intend to give a preview of life after death. The parable teaches in this particular case that both identity and memory remain after death for the soul of the one in a hell. Eastern Orthodox Christians and Latter-Day Saints see the story as consistent with their belief in Hades, where the righteous and unrighteous alike await the resurrection of the dead. 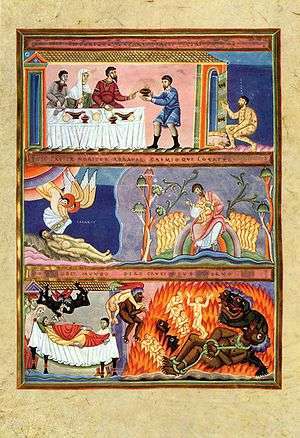 Western Christians usually interpret Lazarus as being in Heaven or Paradise and the rich man in Hell. The belief in a state of Limbo is less common. Some Christians believe in the mortality of the soul ("Christian mortalism" or "soul sleep") and general judgment ("Last Judgment") only. This view is held by some Anglicans such as E. W. Bullinger. Proponents of the mortality of the soul, and general judgment, for example Advent Christians, Conditionalists, Seventh-day Adventists, Jehovah's Witnesses, Christadelphians, and Christian Universalists, argue that this is a parable using the framework of Jewish views of the Bosom of Abraham, and is metaphorical, and is not definitive teaching on the intermediate state for several reasons. In Revelation 20:13-14 hades is itself thrown into the "lake of fire" after being emptied of the dead. "Dives Malus" (the wicked rich man) also known as "Historia Divitis" (c.1640) by Giacomo Carissimi is a Latin paraphrase of the Luke text, set as an oratorio for 2 sopranos, tenor, bass; for private performance in the oratories of Rome in the 1640s. Mensch, was du tust a German sacred concerto by Johann Philipp Förtsch (1652–1732) The story appeared as an English folk song whose oldest written documentation dates from 1557, with the depiction of the afterlife altered to fit Christian tradition. The song was also published as the Child ballad Dives and Lazarus in the 19th century. Ralph Vaughan Williams based his orchestral piece Five Variants of Dives and Lazarus (1939) on this folk song, and also used an arrangement as the hymn tune Kingsfold. Benjamin Britten set Sitwell's text to music in his third Canticle in a series of five. The Order was originally established to treat the virulent disease of leprosy, its knights originally being lepers themselves. According to the Order's official international website, "From its foundation in the 12th century, the members of the Order were dedicated to two ideals: aid to those suffering from the dreadful disease of leprosy and the defense of the Christian faith." Sufferers of leprosy regarded the beggar Lazarus (of Luke 16:19-31) as their patron saint and usually dedicated their hospices to him. 1 2 3 Hultgren, Arland J (2002-01-01). The Parables of Jesus: A Commentary. pp. 110–118. ISBN 978-0-8028-6077-4. ↑ The Gospel According to Luke (I-IX). 1995-03-01. p. 1110. ISBN 978-0-385-52247-2. ↑ Mâle, Émile (1961). The Gothic Image: Religious Art in France of the Thirteenth Century. p. 195. 1 2 Barclay, William (1999-02-01). The Parables of Jesus. pp. 92–98. ISBN 978-0-664-25828-3. ↑ Losch, Richard R (2008). All the People in the Bible: An A-z Guide to the Saints, Scoundrels, and Other Characters in Scripture. pp. 255–256. ISBN 978-0-8028-2454-7. 1 2 e.g. Webpage which argues that Lazarus and the rich man is literally true (whilst the language used by them could have been figurative). ↑ North, Brownlow (1869). "'The rich man and Lazarus' (Luke xvi. 19-31) a practical exposition". ↑ Jeremias, Joachim (January 1998). Die Gleichnisse Jesu. pp. 123–125. ISBN 978-3-525-53514-1. ↑ Companion Bible p1489, citing "Lightfoot xii, 159-63"
↑ "Whittaker, H.A. Studies in the gospels. Biblia, Staffordshire 1984, 2nd Ed. 1989 p495". ↑ Friedrich Gustav Lisco, (trans. Patrick Fairbairn) The parables of Jesus: explained and illustrated 1853 p343 "Many expositors have thought they discovered, in this story, a real history, and referred it to the family of Annas and his son-in-law, Caiaphas,"
↑ Perry, Simon (2012). Resurrecting Interpretation: Technology, Hermeneutics and the Parable of the Rich Man and Lazarus. Eugene, OR: Wipf and Stock. Retrieved 2012-11-18. ↑ "Warren Prestidge, The Rich Man and Lazarus". Afterlife. ↑ "E.W. Bullinger on Luke 16:19-31". ↑ "Jefferson Vann, Reasons why the The Rich Man and Lazarus is not definitive teaching on the intermediate state.". Afterlife. ↑ Bryan T. Huie - Lazarus and the Rich Man - Tentmaker Ministries. Retrieved 14 July 2014. ↑ What Happens When I Die? - When rightly divided, the scriptures support annihilationism; the belief that the wicked will be "destroyed" in the Lake of Fire. - cupofwrath.com. Retrieved 14 July 2014. ↑ "Against Plato, On the Cause of the Universe". ↑ Money talks: folklore in the public sphere December 2005, Folklore magazine. ↑ The Summoners's Prologue and Tale , line 1877 - "Lazar and Dives lyveden diversly, And divers gerdon hadden they therby." ↑ Smith Sheila The Other Nation OUP 1980 pp.12-16 for extended discussion of the Dives and Lazarus imagery. ↑ Graham Elliott, Benjamin Britten: The spiritual dimension, Oxford University Press, 2006, ISBN 0-19-816258-8, p. 100. ↑ Michael Kennedy, The works of Ralph Vaughan Williams. Oxford University Press (London, 1980), p. 278. ↑ Music, David W (2005-01-01). A Selection of Shape-note Folk Hymns: From Southern United States Tune Books, 1816-61. p. 25. ISBN 978-0-89579-575-5. ↑ Philip Reed, Mervyn Cooke, and Donald Mitchell, Letters from a Life: The Selected Letters of Benjamin Britten, 1913-1976, Volume 4: 1952-1957, Boydell Press, 2008, ISBN 1-84383-382-4, p. 294. ↑ "Steeleye Span: They Called Her Babylon (Review)". Progarchives.com. ↑ David Marcombe, Leper Knights: The Order of St. Lazarus of Jerusalem in England, c. 1150-1544 (Rochester, NY: Boydell) 2003; Chapter 1 gives the general history. 1 2 "History", official international website of the Military and Hospitaller Order of Saint Lazarus of Jerusalem. Retrieved on 2009-09-14.